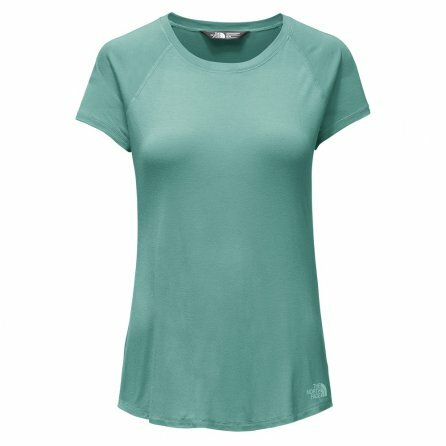 If you think nothing can be more comfortable than a cotton tee shirt, you have obviously never tried on The North Face Versitas Women's Short Sleeve Top. Made from MicroModal®, this top manages to feel softer and is more durable than cotton, meaning it will feel this good and still look great for much longer than your old tee shirts do. Plus it is way more breathable too, meaning this is the perfect top for warm days in the outdoors. I really like this shirt. It is lightweight so it would be good for hiking, running, yoga, or even with jeans. It has a loose feel which I like. I hate when shirts hug my stomach. Love this shirt and how it's float and not tight when I'm wearing it. It's a great t-shirt that I can wear to work, school or to the gym. Easy to clean. Bought to wear with black leggings. Like the longer length. These shirts are so comfortable, and stylish. They launder well, and look great through workouts.